The last years of the twentieth century seemed like the best of times in California. Yet its citizens expressed the worst of fears about the future of the Golden State. What could explain this strangely dissonant outlook in the nation's most economically important and politically influential state—and how has it played out in the political and policy arena? These questions are the focus of this book, especially as they relate to voters' choices in the 2000 election. At the turn of the twenty-first century, two major, competing forces had emerged as the yin and yang of California political life—we might call it the New Economy meets the New Demography. A booming economy and new wealth generated a euphoric mood, and talk about the present was thus enthusiastic. Yet the state's residents also saw signs of troubling long-term trends, many of which—like congestion, pollution, and increasing income inequality—are related to the state's growth and changing demography. People's concerns about these trends and future quality of life were compounded mightily by another trend that developed, paradoxically, during times of plenty—a widespread distrust of government. Californians, by and large, did not believe that government had the ability to handle problems or that it even had their best interests at heart. The confluence of these trends could have many political implications for California. It could affect what issues matter to people and could make them think differently about what government should be doing to solve problems. In a state where policymaking for the past twenty years has been guided by the political principle "smaller is better," it could conceivably alter views about resources the government needs and how involved government should be in serving the public good. Ultimately, it could alter people's thinking about the kinds of leaders they need to elect, change the fortunes of political parties, and give new purpose to exerting policy influence through the initiative process. How these trends affected and may affect California politics is evident in voters' issues and priorities leading up to the 2000 election and is recognizable in the election outcomes. The 2000 election provided choices for Californians who wanted to express their feelings about new directions for public policy. Voters could have broken with the twenty-year "tax revolt" and supported candidates and ballot measures that stood for more taxes and government spending. The outcome could have signaled the start of a new era for the Golden State: one in which the public, comfortable with the present, would look to government to solve tomorrow's problems. In fact, this election was not all that different, and the reasons why distrust undermined confidence in the future during this time of plenty offer important insights into California's future. This book documents a large-scale study, Californians and Their Government, conducted by the Public Policy Institute of California (PPIC) over the course of the 2000 elections and followed up in spring 2001. We began this journey with focus group interviews around the state to gauge the public's mood and concerns. We then conducted a comprehensive series of public opinion surveys before, during, and after all the votes were tallied. We asked Californians about a wide range of issues, including the elections, tax-and-spending policy, public policy issues that were being debated at the time, and, most important, how they felt about their federal, state, and local governments. In spring 2001, we conducted another set of focus groups. One of the common complaints about a public opinion poll is that it offers only a snapshot of voters' opinions before an election. In other words, polls are accurate only insofar as they can tell us how people say they will vote on a specific issue at a certain time. The goals we had in mind for this investigation were quite different from the goals of those engaging in preelection polling. We were not interested in predicting a winner, either in the presidential race or for other items further down on the ballot, nor were we concerned about who was ahead and by how much at a given point in time. Our purpose was to find out how the unusual mix of current prosperity, future worries about growth and change, and voters' distrust in government was affecting policy preferences and ballot choices in 2000. We needed to take multiple measures of each of these dimensions at different times. We also needed to make sure that we interviewed a sufficient number of people to be able to break out the results for important demographic and political subgroups and regions. In the end, we provided an in-depth portrait over time of California voters' opinions during the 2000 elections. As noted previously, we conducted a series of focus groups in several of the major regions of the state. Focus groups are not intended to be scientific and representative surveys of public opinion. They use qualitative methods and seek to engage groups of people in a structured conversation about issues and experiences. I used the conversations generated in these focus groups for two distinct purposes. First, they helped me to develop survey topics and specific questions on population growth, ongoing change in the state, and the role of state and local government. Second, they provide quotations to bring to life some of the issues and concerns revealed by the surveys. Generally speaking, what we heard in focus groups was largely similar to what we learned from the surveys. The first set of focus groups was conducted in collaboration with a nonpartisan group called California 2000, which was funded by major state foundations. We joined forces since their interests coincided with the larger goals of my Californians and Their Government project. The focus groups were carried out by the Nelson Communications Group.1 Eight focus group interviews were conducted in May 1999 in Sacramento, Santa Clara, San Diego, and Los Angeles. In April 2001, with the California elections a fading memory and the state in the midst of an electricity crisis, I returned to Santa Clara, Los Angeles, and Sacramento to conduct a second set of six focus groups.2 In all, we talked with about 170 individuals in the course of these interviews, focusing on such issues as California's growth trends and the state's future, distrust of government, the role of state government, and elections. The major data collection effort, however, consisted of a series of large, comprehensive public opinion surveys. One purpose of the surveys was to provide an in-depth profile of political, social, and economic attitudes; public policy preferences; and ballot choices. Another purpose was to build on my previous work on government distrust and to develop a deeper and more thorough understanding of Californians' perceptions of how their government works and what it does, the role it plays in their lives, how well it currently performs, and the place they would prefer for government to have in their lives. This was, of course, in the context of a federal and state government that had surplus funds at its disposal. The surveys involved random-digit-dial telephone interviews, each with a minimum of 2,000 adult residents. Every survey included the responses of at least 400 Latinos, with the interviews conducted in English or Spanish as needed, so that we could represent this increasingly large and politically influential group. Individual surveys were also large enough to break out the results for the major regions throughout the state (i.e., Los Angeles, the rest of Southern California, the San Francisco Bay Area, the Central Valley), voter groups (i.e., Democrats, Republicans, independents), and demographic subgroups. We interviewed both voters and nonvoters, so that all Californians were represented, but we also separately analyzed the results of "likely" voters for the questions pertaining to the March primary and November general election. Every survey was about twenty minutes in length and included a range of attitudinal and factual questions. Some of the questions were repeated from national surveys, thus offering a comparison with California. Other questions were repeated in the course of the series and thus provided an opportunity to look at responses over time. Since the surveys were conducted over a relatively short time frame and many of the responses remained in a narrow range, we were also able to merge the responses of survey questions that were repeated over time—such as optimism about the state, political ideology, policy preferences, and demographic characteristics—thus providing a large data base that included the responses of over 22,000 Californians during the 2000 election cycle. This book, then, offers evidence from two original sources—focus groups and statewide surveys—supplemented with published data from a variety of other organizations. For instance, there are the exit polls of state voters from the major news organizations, such as the Voters News Service and the Los Angeles Times poll. We also analyze the actual vote tallies in the March primary and November general election, as prepared by the California secretary of state. There are demographic and economic data from the U.S. Census, the California Department of Finance, and other sources. Finally, there are public opinion surveys from state and national polling organizations that provide further context on the state and national mood during the 2000 elections. Over the course of several decades, distrust in government has commonly been defined in two different ways: one is through the level of confidence that people have in the public institutions that serve them, such as the executive and legislative branches of state, federal, and local government; the other is through the general perceptions that the public has toward the ways that the government and its elected officials perform their duties, such as their effectiveness, responsiveness, efficiency, fairness, and honesty. In tandem with these efforts to measure trust in government are the common questions on job approval ratings of current office holders and global satisfaction with the nation's direction; in many ways, these answers also reflect the public's confidence and trust. Whichever of the two ways one defines and measures trust in government, the results have been consistent over time. There was a high level of trust and confidence in government in the mid-1960s, that is, in the years after the assassination of President John Kennedy, the beginning of the Great Society by President Lyndon Johnson, and the era of strong economic growth and a Cold War threat. Over the next ten years, the national government faced a series of important crises—the Vietnam War, urban race riots, high crime rates, an oil embargo, inflation, and the Watergate scandal—and by the mid-1970s, all measures of trust and confidence in government were showing significant declines. Since then, the public's reports about their trust in government have been fairly negative throughout economic recessions and recoveries, approval and disapproval of specific office holders, and changes of party control and presidential leadership. Many observers say that trust in government reached its lowest point in 1994, the so-called year of the angry voter, during which the Republicans took control of the legislative branch of the federal government, and also a time of deep economic recession. Then trust is thought to have steadied when the economy recovered and even rebounded somewhat for the remainder of the 1990s through 2000. Still, distrust in government was running fairly high by the longer historical standards throughout the entire 2000 presidential election. The measures of trust in federal government showed significant improvements immediately after the terrorist attacks in New York and Washington on September 11, 2001. There has been a considerable amount of attention devoted to the causes of the public's distrust in government. Some studies have sought to link personal characteristics such as age, education, gender, income, and occupation with attitudes toward government, but others argue that trust in government cannot really be explained by these factors (see Baldassare, 1986; Barber, 1983; Lipset and Schneider, 1983). A few have examined the effects of living in urban and suburban communities on trust in government and have found at most modest effects (Baldassare, 1986; Fischer, 1975, 1984). Some have looked at media biases and a lack of knowledge as the causes of mistrust. Other scholars have focused on the role that historic events, policy decisions, and their outcomes have on the mood of the people toward their government (Citrin, 1974; Miller, 1974a) in light of office holders' responses to crises, emergencies, wars, scandals, economic booms, and fiscal failures; focusing on these causal factors has by far seemed the most promising in terms of explaining time trends in distrust. In essence, we take the position shared by others that trust in government is an attitude reflecting the sum total of experiences and knowledge the public has toward its government institutions and its elected officials at any given time. It is a composite feeling of how the public feels about the responsiveness, effectiveness, competence, caring, efficiency, honesty, fairness, and other attributes of its government and leaders. Of course, this judgment will be based on a mixture of direct and indirect experiences: few people meet their president, but many learn about the president and Congress from reading newspapers and watching television and from interpreting the news with friends and family; likewise, people from time to time do have experiences with government agencies, such as the U.S. Postal Service, military, Social Security Administration, or Internal Revenue Service, and these personal events can also shape trust in government. In other words, we would argue that distrust in government, as measured in public opinion surveys, is largely a rational response to people's experiences with government and their interpretation of all of the information they are receiving from the media and other sources about how their government and elected officials are functioning at a given time. This influence of external events can explain why levels of trust in government can shift suddenly in some places, while holding steady in certain Western societies over a lengthy period of time. Why is trust in government an important issue for us to consider? It is because distrust can have profound consequences for the ability of public officials to govern. Many scholars have argued that a government and its leaders cannot function without some minimum level of trust from the public; exactly how much trust is required is a subject of controversy. The need for trust in government is, of course, especially true in a democratic society. If voters are to elect their representatives to make public policy choices in their interest, then they have to trust the representatives to do so. If people do not trust their elected officials, then they might not respect the laws the officials make, and this may lead some members of the public to question the need to comply with the rules and regulations governing their society, such as paying taxes. If the public does not trust the government, then it might elect people who want to restrict the role of government, its size and spending, or its abilities to plan and act on behalf of the public. A lack of government action could hinder, or even endanger, the well-being of the public. Or, if voters have the ability through state and local initiatives, they may take lawmaking into their own hands and make policy decisions on their own. The study reported in this book builds upon the large body of literature on trust in government and contributes to knowledge in several important ways. In our surveys, we repeat many of the questions about the federal government that have been asked in national surveys over time, specifically, those concerned with attitudes toward the effectiveness, efficiency, and responsiveness of government. We also refocused the typical survey questions so that we could measure the California public's trust in state and local government, which are important public institutions in people's lives that have received much less attention in the scholarly literature. In analyzing distrust in government, we agree with those scholars who argue for looking at individual questions rather than composite indices. Having established the high levels of distrust in federal, state, and local governments, we then go on to explore how these underlying doubts about government have expressed themselves in public policy preferences, candidate selections, and certain ballot choices during the 2000 elections. There is no doubt that the issue of distrust in government has a rich history in the California political context. The state is the home of the tax revolt in the late 1970s, the birthplace of the Reagan Revolution in the 1980s, and the headquarters of many political causes of the left and right in the 1990s that have challenged the political status quo and questioned the decisions of governmental authorities. Most important, the state's residents have time and again demonstrated a profound distrust of government through their active and creative use of the state's initiative process. Indeed, the voters enacted the citizens' initiative in the early twentieth century in response to state government corruption and incompetence. Californians have voted in favor of initiatives that have changed their state constitution and thus exerted their authority over the executive, legislative, and judicial branches of state government. They have voted for initiatives that limited the terms of state office holders, restricted the amount of money they pay in local property taxes, mandated the amount of funding the state legislature must earmark for programs they like, eliminated government programs they did not care for, decriminalized the use of drugs that the government deems illegal, determined the length of prison sentences so that judges and legislators cannot use their discretion, and changed the voting rules for primaries so that parties cannot determine who votes for candidates. Sometimes, the public's distaste for government dictates has let to legal battles that have been resolved by courts' overturning their initiatives, resulting in more distrust of government. In all, the extent, roots, and consequences of the state residents' seemingly profound distrust in government offer us an excellent and special case to study. The unique circumstances of California at the turn of the century offer another reason to study the public's distrust of government in this state's setting. California has enormous private resources within its state's borders, yet its public institutions have not kept pace with the enormous demands created by a fast-growing population (Schrag, 1998). In almost every category of state spending—schools, highways, prisons, infrastructure—California lagged well behind other states in the nation. A lack of planning and preparedness is at least partly a result of limits the public placed on government itself through restrictive initiatives, though those limits placed on government could also be viewed as a reaction by voters who were disappointed in the past performance, efficiency, and responsiveness of their state government. As we shall see later, the public's expectations for what needed to be done to accommodate growth and change by their government were high at this time. There was widespread recognition of the immensity of the tasks at hand and the shortcomings of current efforts. During times of prosperity and obvious needs, would the public overcome its fears of government failure and give its elected officials more resources to tackle problems or would it continue to be reluctant to see its government act in a bigger, bolder way? The public's well-being could depend on the resources the voters will allow their government to have in its efforts to be prepared for the state's challenging future. How Californians resolved this problem of distrust is the focus of our inquiry. The 2000 election was an especially important and revealing event. The state and nation were in an unprecedented, long period of economic prosperity and job growth. The nation was at peace, and the federal government had a large budget surplus. Yet the national political scene was anything but stable. President Bill Clinton had lied under oath about an affair with a White House intern while under investigation for other alleged, but never proven, wrongdoings. After the 1998 midterm election, Clinton was impeached by a U.S. House of Representatives that voted along party lines. The Clinton presidency survived a trial in the U.S. Senate that was also largely decided along partisan lines. This left many voters in an ambivalent mood, still liking the job Clinton was doing in office but tiring of his personal antics. Other voters were equally disturbed by the Republican leaders in Congress, whom they saw as pursuing an effort to "get" Bill Clinton, which most of the public did not want. These were not normal times, and this would turn out to be a highly unusual election. California's presidential primary has historically been a political nonevent, but the script was changed in 2000. The primary is typically held on the first Tuesday in June. By that late date, other state primaries have been decisive in choosing the standard-bearers for the Republican and Democratic parties. In 2000, California moved its primary up to early March so that it could be a player in the presidential selection process. Both parties had competitive presidential primaries in the early going—Vice President Al Gore and former U.S. Senator Bill Bradley on the Democratic side and Governor George W. Bush and U.S. Senator John McCain on the Republican side. The state's voters thus received an earlier and steadier dose of political campaigning than they had in the past. They were exposed to a range of issues and policy discussions beginning in the fall of 1999. After the primary season was over, the political parties and the presidential nominees did not abandon the Golden State. They spent considerable time and resources courting the California voter, along with the state's big prize of fifty-four electoral college votes. The Democrats concluded that they could not win without taking California. The Republicans were never willing to give up on the Golden State, since there had never been a time in the twentieth century that the GOP took the White House without winning in California. So the Bush campaign spent millions of dollars on television advertising, while the Gore campaign countered by sending Clinton in during the closing days. There were many other factors that also propelled national politics to center stage for the state's electorate. The presidential campaigns made regular pilgrimages to the Silicon Valley, both because it was a source of campaign funds and because it had become the symbol of the New Economy. The Democratic national convention took place in Los Angeles in mid-August. Also, the candidates used the backdrop of the state's ethnic and racial diversity—especially the increasingly large Latino community—to display their skills at the politics of inclusion. Voters heard their plans for tax cuts, spending the budget surplus, improving the schools, and protecting the environment. This intense activity provided us with an up-close view of the electorate's moods, politics, and priorities. In twenty-two of the twenty-five presidential elections in the twentieth century, the candidate who won in California became the occupant of the White House for at least four years. Not this time. In California, Gore won the state over Bush by a huge margin of 1.3 million votes. Gore ended up winning the national popular vote by about a half-million votes, but he fell a few "chads" short of taking the state of Florida. What followed was a suspenseful and strange few weeks of recounting the Florida ballots, interrupted by legal maneuverings. Eventually, the U.S. Supreme Court overruled the Florida Supreme Court and the counting stopped. Again, political turmoil seemed to be the undercurrent in these prosperous times. The electoral college vote gave the presidency to George W. Bush. The presidential election was the main event, but there were several other noteworthy ingredients to the 2000 election that required our close attention. There was a U.S. Senate election for the seat held by Dianne Feinstein. The Republican primary offered up moderate and conservative choices, while the Democratic incumbent was unchallenged. The declining political fortunes of Republicans in statewide elections had been partly blamed on the fact that their conservative primary voters were choosing candidates who were too far to the right for the state's overall electorate. The open primary was supposed to change all of this, since more moderate voters from the independent ranks and other parties could participate in the GOP primary. The winner on the GOP side was a moderate, pro-choice politician from the Silicon Valley—U.S. Congressman Tom Campbell. The plan seemed to be working for the GOP, until their moderate candidate lost by a landslide of over 2 million votes in the general election, providing further evidence of the troubles that Republicans now have winning against Democrats in the Golden State. The legislative races around the state provided us with an opportunity to better understand the political mood and shifting landscape on the ground in California. The state's fifty-two U.S. House members represent the largest delegation that any state sends to the U.S. Congress. Those federal seats were up for grabs, as were all eighty of the seats in the state assembly and twenty of the forty seats in the state senate. With the balance of power narrowly in favor of the Republicans in the U.S. Congress, there was national attention and considerable statewide interest in a half-dozen hotly contested seats. Once again, these legislative races provided an opportunity to test the importance of issues and ideas for voters. As it turned out, voters were more comfortable with the approach of the Democrats than with the Republican leaders in Congress. The Democrats won most of the closely watched contests and extended their already sizable leads in the U.S. House, state senate, and state assembly. Of equal importance, the changing demography—in the form of a growing Latino and Asian vote—seemed to be playing an important role in tipping the vote in legislative districts away from Republicans and into the Democrats' column. California voters were also served a full course of state ballot propositions during the 2000 primary and general election. There were twenty state propositions on the March 2000 primary ballot. They included eight citizens' initiatives, two referenda that sought to overturn existing state laws, and ten measures offered by the state legislature. Twelve passed, and eight failed. In November 2000, there were eight state propositions, including three from the state legislature and five that were citizens' initiatives. Five passed, and three failed. Millions of dollars were spent on initiative campaigns, and a major element of media election coverage was devoted to ballot items. The statewide initiatives in the 2000 elections offered us a feast of information on Californians' views on specific issues, policy priorities, and spending preferences. We picked a few controversial initiatives and closely followed them with our surveys through the March primary and November election: three ballot measures concerned with educational reform, since voters had been telling us in surveys that schools were their top issue, and a citizens' initiative regarding a socially conservative cause, that is, the ban on gay marriages. While they were not a specific focus of our surveys, the votes on multibillion-dollar state bond measures on water and parks were also informative, since they told us how distrustful voters viewed the prospects of substantially increasing the state's debts to deal with their environmental concerns during prosperous times. There were also a substantial number of growth control initiatives on local ballots in 2000 that are very revealing of voters' main concerns and policy interests. Indeed, there were more local growth measures on the ballot in California than anywhere else in the nation and more initiatives in this election than had been evident for many years in the state. Not only were there more ballot measures, but many were bolder and broader than in the past, such as seeking to ensure that voters always have their say in growth. Many attributed the increase in local growth initiatives to an improved economy, which generated traffic problems and suppressed fears about growth controls. In California, the trend was for voters to take decisions about growth away from their local elected officials. They wanted to take land use matters into their own hands, once again indicating that voter distrust is a powerful force in shaping policy choices. We know from the overall results of the local elections that local growth initiatives went over well with the voters in 2000. We also know that local growth initiatives achieved their greatest successes in the areas of the state that were the most upset with traffic and growth and the most content with the economy. Clearly, these local ballot measures reflected expressions of voter distrust with local officials charged with the duty of maintaining the quality of life in times of growth and change. What happens in California politics and elections is important to the nation and world. The state has political and economic significance beyond its borders. It has the largest electoral college vote in presidential elections. It sends the biggest delegation to the U.S. Congress. The state's economy is larger than all but five nations on the planet. It has become the destination and home to people throughout Asia, Latin America, and Europe. California has the added status of being a premiere social and cultural trendsetter, making what is happening in the state worth watching for the entire nation. Thus, the events surrounding the 2000 election in California have broader significance than on California only. Nonetheless, it has become popular in the national press to declare that California is irrelevant to the rest of the nation. It is no longer a trendsetter, they say. Rather, it is a demographic, geographic, and political oddity. "California Doesn't Matter" was the conclusion of a leading political pundit (Barnes, 2000). The status of being a unique state is not new, dating back at least to the classic book California: The Great Exception (McWilliams, 1949). During the 2000 elections, East Coast political pundits seemed fixated on a new idea—California's lack of significance for national politics. Here is the basic logic for the state's political irrelevance: California is too big and diverse to matter in elections anymore. In other words, its population is too large and ethnically and racially mixed to reflect the nation or predict what will happen in any other state. Most recently, its politics have been viewed as too Democratic-leaning to have much relevance for a nation that is evenly divided along political party lines. Consider the fact that the national presidential election ended in a statistical dead heat, the U.S. Senate in a 50-50 tie, and the House of Representatives narrowly controlled by the GOP. Is it time to look for another national trendsetter, say Florida or Oregon? In California, statewide elections and political power are solidly in Democratic hands. What can we possibly learn from an analysis of the 2000 election in the Golden State? I would argue that California remains centrally important because of its size. One in seven Americans calls the state home. No state comes close to California in the size of its population, and none had more of a population gain in the last few decades. Its media markets in a dozen geographic regions contain every possible version of urban, suburban, and rural locales that is available on the national landscape. As for the economy, it is often said that if California sneezes, the nation catches a cold. When the lights went out during California's electricity crisis, businesses elsewhere worried about the impact, and the national press, reflecting the state's relevance, covered the story on a daily basis. In the realm of politics, no state has as many members in the U.S. Congress; after the 2000 Census, California was awarded fifty-three Congressional seats. Nor does any state have close to as many members in the electoral college: in 2004, California will have fifty-five electoral college votes. Certainly, in Bush's defeat of Gore in 2000, we learned that it is possible to win in the presidential electoral college without California, but we saw how difficult it is to do so. Although California is ahead of the curve in becoming a "majority-minority" state in its racial and ethnic makeup, the 2000 U.S. Census surprised us in showing that Asian and Latino immigration is a fact in many states that have traditionally been predominantly white with minority black populations.6 Overall, the Latino population in the United States now outnumbers the black population, and the Asian population is the fastest-growing group. It seems certain that many other states can learn from California as they too face a major change in their racial and ethnic mix. Among other things, California's experience tells others how the political landscape can be altered by increasing diversity. California is also worth watching for its ability to create, innovate, and experiment. Even now, the rest of the nation waits to see the latest trends coming out of the Silicon Valley. The state has been an economic hotbed for software, multimedia, and Internet start-up companies. Its residents lead the nation in computer, email, and Internet use and in discovering new ways to incorporate the Internet into their everyday lives. The political arena is no different. The initiative process allows policies and lawmaking to move much more quickly, and in an unconventional fashion, bypassing the executive and legislative arena. The state gets to try out new ideas that the voters accept, including tax limits, term limits, casino-style gambling on Indian reservations, use of marijuana for medical purposes, or elimination of bilingual education in public schools. The residents of other states can and sometimes will imitate California's political trends. So it is worth taking note of how Californians' distrust of government surfaced in prosperous times. This book is divided into nine chapters. In this first chapter, I offer an introduction to the theme of this book, which is the persistence of public distrust in government during the immediate circumstances of budget surplus and economic prosperity, and the long term trends of dramatic social and economic change. I then review the way we approached this issue, which was to conduct multiple, large-scale surveys during the 2000 elections. I review the basic knowledge on distrust in government and discuss the context of the 2000 election. In addition, I consider the continued relevance of California's experiences with political, social, and economic trends for rest of the nation. In Chapter 2, "Sunny Today, Cloudy Tomorrow," I provide an overview of the public's mood during the 2000 elections in California: I consider the unique nature of the state's "politics of prosperity" in light of previous thought about how the public reacts to government in more affluent conditions. In sum, the voters were feeling economically secure and yet highly pessimistic about their future quality of life in the state. I hypothesize that this combination is a result of Californians' distrust of elected officials and government and that it leads to hesitation about expanding the government's role. In Chapter 3, "The Tax Revolt and the Golden State," I address the central questions of what happens when voters' distrust from the twenty-year tax revolt confronts the reality of federal and state budget surpluses. I reexamine what is known about public attitudes toward tax and spending. I look at the public's reactions to campaign and policy proposals to spend the surplus, including providing more funds for government programs in general and specific programs that are seen as popular and useful to the general public and to reducing taxes and paying down the national debt. In Chapter 4, "Schools, Schools, and Schools," I examine the strong emphasis Californians placed on improving the quality of the public school system. Voters told us that schools were their top priority for government action, yet when I look at how Californians responded to education initiatives on the 2000 ballot, I find they are concerned about the prospect of their taxes increasing for schools. In Chapter 5, "Growth and Environmentalism," I consider the political focus on growth and environmental issues in good economic times. I follow the reemergence of the growth control initiatives on the local scene, after a hiatus during the recession of the 1990s, as evidence that residents distrust local elected officials and want to make the land use and growth decisions on their own. Moreover, environmental problems were much on people's minds in 2000, challenging the public to think about the government's role in addressing regional, state, and global environmental issues. In Chapter 6, "The Latino Century Begins," I look at the population group expected to be the largest racial and ethnic group in the state by the 2020s. Latinos continued their pattern of increased voting in the 2000 elections. Thus, they played an important role in the outcome of statewide elections, and many Latinos won in federal and state legislative races. Latinos differ from other groups, expressing more trust in government and a desire for government to play a more active role in their lives. If trends persist, growth in the Latino population could result in a shift in Californians' distrust of government. In Chapter 7, "The Un-Party State," I explore the common misconception that California has become a one-party state ruled by the Democrats. Actually, there has been no shift in the voter registration toward either of the major parties. Instead, the partisan leanings of the increasing numbers of voters outside of the major parties explain the current election trends. Moreover, distrustful Californians prefer to make new laws by voting on citizens' initiatives, rather than having partisan elected officials making policy decisions. I look at how the voters reacted to the 2000 elections, including the presidential vote and ballot controversy in Florida, and the state's initiative process. In Chapter 8, "Lights Out for California?" I offer some thoughts about how Californians reacted to an obvious and serious government failure. Californians were thrown into uncertainty by an electricity crisis that threatened higher utility bills, rolling blackouts, and a slowing economy. The problem had its roots in a flawed deregulation law passed by the governor and legislature. This episode reinforced Californians' distrust in government, their perception that the state is unprepared for its future, and their desire to take lawmaking into their own hands. In Chapter 9, "Insights after a Golden Moment," I provide an array of observations about what we have learned about distrust of government from viewing this phenomenon during a time of budget surplus and economic prosperity, and then during an electricity crisis that nudged the public's mood toward further pessimism, followed by the terrorist attacks of September 11, 2001, that shook American lives from coast to coast. I also offer some recommendations for making California's unique democratic system work—a critical first step in restoring public confidence in government and elected officials. 1The results of the focus groups referred to in this book were summarized in a client report, "California 2000," prepared by the Nelson Communications Group (1999). I also had the audio and videotapes available for further analysis and use in this book. 2Kay Lavish moderated and provided analysis for these focus groups. 3See www.ppic.org for the methods and questions for each PPIC Statewide Survey. 4This section relies on a wealth of political science literature on this topic, including Citrin (1974); Citrin and Luks (1998); Citrin and Muste (1999); Erber and Lau (1990); Hardin (1996); Howell and Fagan (1988); Levi and Stoker (2000); Lipset and Schneider (1983, 1987); Miller (1974a, 1974b); Nye, Zelikow, and King (1997); Sears et al. (1978); Warren (1992, 1996, 1999); and Wendy Rahn's conference paper cited in Nye, Zelikow, and King (1997:291). 5See Cain and Gerber (2002) for discussion of California's blanket primary. 6For the sake of brevity, the designation whites will be used in place of non-Hispanic whites throughout the book; the designation blacks will refer to people who call themselves black or African American and the designation Latino to people who describe themselves as Latino or Hispanic. Mark Baldassare, one of California's leading public opinion experts, gives an authoritative and highly informative view of the state during its recent years of prosperity and more recent economic insecurity. 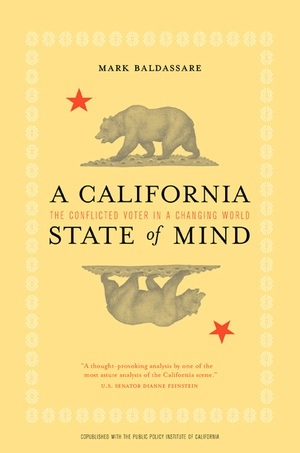 Based on findings of the most comprehensive public opinion survey in the state, this book examines the beliefs, concerns, and public policy preferences of Californians during the 1990s, focusing in particular on Californians' deep and ongoing distrust of government and the way this distrust has shaped the recent political climate. 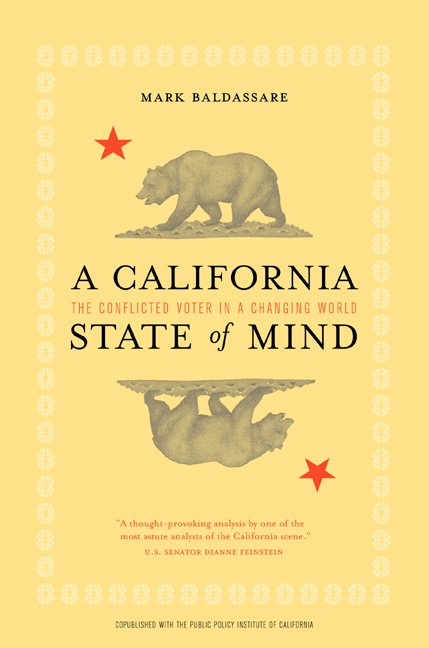 A California State of Mind combines an incisive analysis of long-term trends—such as population growth and changing demography—with up-to-date discussions of how the recent electricity crisis and the September 11 terrorist attacks have affected residents' distrust of government, making this book a key source for Californians as they consider the future. Mark Baldassare is Program Director in Governance, Survey Director, Senior Fellow, and Arjay and Frances Fearing Miller Chair in Public Policy at the Public Policy Institute of California. He is the author of eight previous books including California in the New Millennium (California, 2000), When Government Fails: The Orange Country Bankruptcy (California, 1998), and The Los Angeles Riots: Lessons for the Urban Future (1994). 8. Lights Out for California?